Netpredictor is an R package for prediction of missing links in any given unipartite or bipartite network. The package provides utilities to compute missing links in a bipartite and well as unipartite networks using Random Walk with Restart and Network inference algorithm and a combination of both. The package also allows computation of Bipartite network properties, visualization of communities for two different sets of nodes, and calculation of significant interactions between two sets of nodes using permutation based testing. The application can also be used to search for top-K shortest paths between interactome and use enrichment analysis for disease, pathway and ontology. The R standalone package (including detailed introductory vignettes) and associated R Shiny web application is available under the GPL-2 Open Source license and is freely available to download. We compared different algorithms performance in different small datasets and found random walk supersedes rest of the algorithms. The package is developed to perform network based prediction of unipartite and bipartite networks and use the results to understand the functionality of proteins in an interactome using enrichment analysis. The rapid application development envrionment like shiny, helps non programmers to develop fast rich visualization apps and we beleieve it would continue to grow in future with further enhancements. We plan to update our algorithms in the package in near future and help scientist to analyse data in a much streamlined fashion. They use label information and as well as unlabeled data as input in the form of vectors. Once can use multiple classes inside the network structure. It uses multitude of paths to compute associations. Network based methods mostly use transductive learning strategy,in which the test set is unlabelled but while computation it uses the information from neighbourhood. Analysis of molecular profiling and drug response data. Analysis of gene expression profiles and network topology of cancer. Analysis of cyanobacterial genome and interactive genome visualization. Identifies structural analogs in large databases such as ChEMBL,Drugbank and CMAP. Functional analysis of gene expression data. Exploration of DNA methylation sites over genome. The ranked list of proteins can be also be used to understand any protein proteins interactions exist among them using subgraph extraction or it can be used to understand neighbouring PPIs in the interactome. Such kind of networks helps in understanding of pathogenic and physiologic mechanisms that trigger the onset and progression of diseases. To dig deeper into such cases, the list of proteins can be used to perform Gene Ontology,disease and pathway enrichment to understand the mechanism of action of proteins and whether if that target is a suitable target or not. In the PPI Network tab consist of three functionalities namely one can search for protein interaction from a list of proteins, search for top-k PPI shortest paths using Yen’s algorithm  using both weighted and un-weighted graphs. The algorithm executes O(n) times Dijkstra algorithm to search paths for each of the k shortest paths, so its time complexity is O(kn(m+nlogn)), where n is the number of nodes and m is the number of edges. Shortest path graph algorithm has been widely adopted to identify genes with important functions in a network [26–30]. We also provide sub-graph extraction from the PPI datasets using a large list of proteins using ConsensusPathDB  and string  databases. The local path based metric  uses the path of length 2 and length 3. The metric uses the information of the nearest neighbours and it also uses the information from the nodes within length of 3 distances from the current node. The Katz metric  is based on similarity of all the paths in a graph.This method counts all the paths between given pair of nodes with shorter paths counting more heavily. Parameters are exponential. Geodesic similarity metric calculates similarity score for vertices based on the shortest paths between two given vertices. Hitting time  is calculated based on a random walk starts at a node x and iteratively moves to a neighbor of x chosen uniformly at random. The Hitting time Hx,y from x to y is the expected number of steps required for a random walk starting at x to reach y. Random walk with restart [16, 45, 46] is based on pagerank algorithm . To compute proximity score between two vertexes we start a random walker at each time step with the probability 1 - c, the walker walks to one of the neighbors and with probability c, the walker goes back to start node. After many time steps the probability of finding the random walker at a node converges to the steady-state probability. The significance of interaction of links is based on random permutation testing. A random permutation test compares the value of the test statistic predicted data value to the distribution of test statistics when the data are permuted. Supporting Information S1_NetpredictorVignette provides tutorial for this netpredictor standalone R package. In the web application app one can load their own data or can use the given sample datasets used in the software. For the custom dataset option one needs to upload bipartite adjacency matrix along with the drug similarity matrix and protein sequence matrix. From the given datasets Enzyme, GPCR, Ion Channel and Nuclear Receptor in the application one can load the data and set the parameters for the given algorithms and start computations. The data structure the web application accepts matrix format files for computation. A summary of the contents of each of the tabs shiny netpredictor application is reported in Table 2. The load data and selection of algorithms panel allows users to load custom data or example datasets in matrix format. Users need to upload the matrices binary drug-target bipartite network, drug –drug similarity and protein – protein similarity along with algorithm and parameters of choice. The network properties several different properties of the bipartite graph such as the degree centrality of two types of nodes, density of the network, betweenness of two types of nodes, total number of interactions, count of each type of nodes. Bipartite network modules are computed using the lpbrim algorithm  the tab shows the bipartite nodes as tables and module network. Modules are dynamically updated based on input data. For a given dataset to compute the results one can select any one of the algorithms. The results are shown using the jquery Data Tables library. The table shows the drugs, targets, pvalues, outcome (True/predicted interaction). 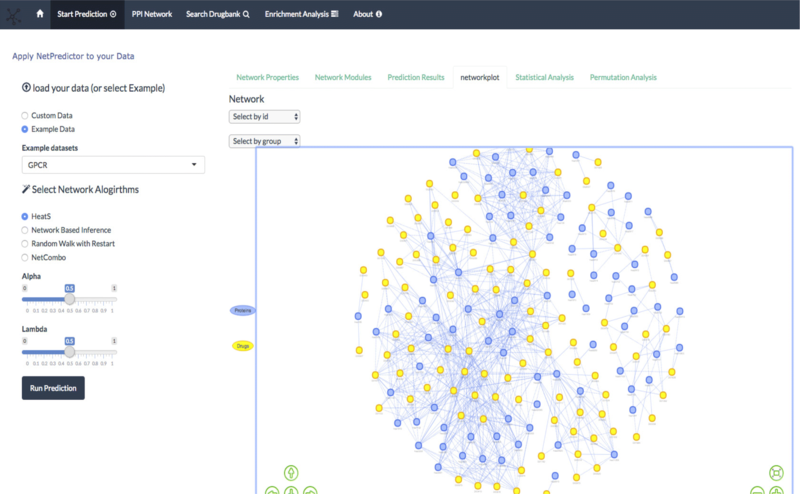 The network plot tab plots the computed predicted network. It uses visNetwork package which uses the vis.js library to generate network. The predicted interactions are marked in dashed lines and true interactions are marked with bold lines. Drop downs are provided to select specific nodes and groups. The statistical testing tab tests the performance of the model based one the random removal of true links from the network based on the frequency of the drug-target associations. It measures the auac, auc, auctop(10%), bedroc and enrichment of links. Based on these scores we select which algorithm to use. In permutation testing significance of the associations are calculated by, randomly permuting the matrices and and compute the significance using, standard normal distribution. 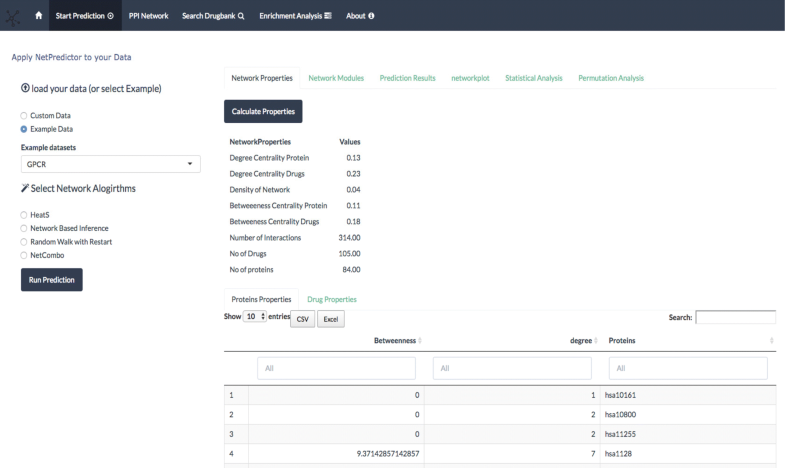 This tab allows users to search predicted drug target associations from the drugbank database from 5970 drugs and 3797 proteins from a total of 316645 predicted and 14167 true interactions. 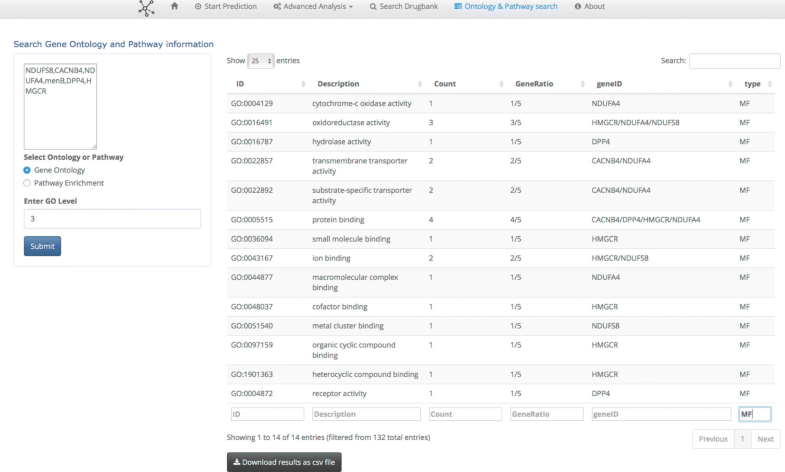 This tab allows users to search for enrichment of Ontologies and Pathways using a given set of genes. The start prediction tab is designed to upload a network in matrix format and compute it properties, searching for modules, fast prediction of missing interactions, visualization of bipartite modules and predicted network. For the custom dataset, in the input drug-target binary matrix, target nodes should be in rows and drug nodes in the columns. The drug similarity matrix and the target similarity should have the exact number of drugs and targets from the binary matrix. For HeatS, only the bipartite network is used to compute the recommendation of links. For RWR, NBI, and Netcombo all of these require three matrices. The default parameters are already being set for the algorithms. The main panel of the start prediction tab has four tabs that compute network properties, network modules, the prediction results and predicted network plot. One can also perform advance analysis using two tabs namely - statistical analysis tab and permutation testing. The statistical analysis tab computes the performance of the algorithms. Three algorithms are network based inference, random walk with restart and netcombo can be used. One can randomly remove the true links from the network using frequency of the drug target interactions in the network. The performance of the algorithm is checked when the removed links are repredicted. The statistics used to evaluate the performance is AUAC, AUC, AUCTOP(10%), Boltzmann-enhanced discrimination of ROC (BEDROC)  and enrichment factor(EF). The data table gets automatically updated for each of the computations. The results are reported in main panel using data tables. The significance of interactions using random permutations can be computed for the given network using network based inference and random walk with restart. The networks are randomized and significance of the interactions are calculated based on standard normal distribution. The user needs to give total number of permutations to compute and the significant interactions to keep. In the current application we used human protein-protein interaction (PPI) data from both consensuspathDB(CPDB) and string DB. The data sources are converted to igraph objects for faster loading and computation. We have implemented top-K shortest paths search using Yen’s algorithm (), with PPI in both the datasets. The multiple shortest path proteins can be enriched for reactome pathways using over-representation analysis. We also provide sub-graph extraction from the PPI datasets using a large list of proteins. can be useful for connecting sources to targets in protein networks, a problem that has been the focus of many studies in the past which include discovering genomic mutations that are responsible for changes in downstream gene expression  studying interactions between different cellular processes  and linking environmental stresses through receptors to transcriptional changes. The details are of the PPI tab are discussed in the supplemental information. The drugbank tab helps to search predicted interactions computed using NBI method using the drugbank database. One can search for targets given a specific drugbank ID and search for drugs given a specific hugo gene name. 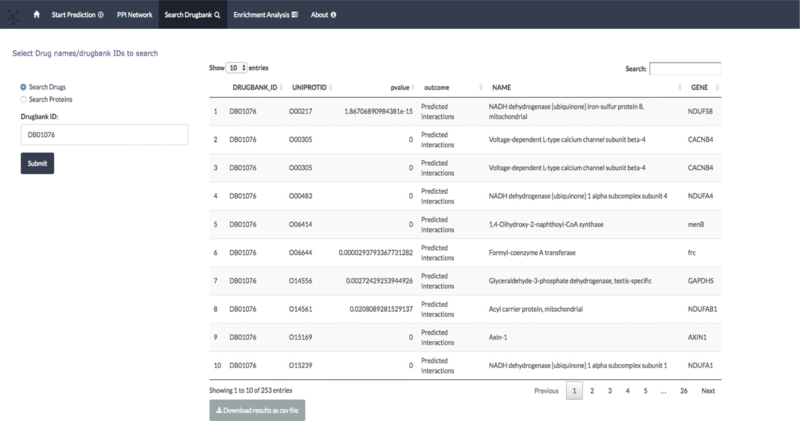 The Enrichment Analysis tab helps to search the relevant gene ontology terms,pathways and diseases for a given list of genes. A search can be made based on predicted proteins and in order to understand its function, location and pathway this tab can help to understand it. The level of ontology can also be given to the user input. We used biomart services using the biomaRT R package to convert genes names to entrez ids and then the clusterProfiler R package () to retrieve the gene ontology lists. The pathway enrichment is based on the ReactomePA R package (). The drugbank tab Fig. 4 helps to search predicted interactions computed using NBI method using the drugbank database . One can search for targets given a specific drugbank ID and search for drugs given a specific hugo gene name . In Fig. 3 the data table shows the drug target significant scores whether it is a true or predicted interaction, Mesh categories of drugs, ATC codes and groups (approved, illicit,withdrawn, investigational, experimental). Currently the drugbank search tab only supports data computed using Network based inference. The computed results and the associated meta-data are stored in a sqllite database  for access through shiny data tables interface. The Ontology and pathway search tab Fig. 5 helps to search the relevant gene ontology terms and pathways for a given set of genes. A search can be made based on predicted proteins and in order to understand its function, location and pathway this tab can help to understand it. The level of ontology can also be given to the user input. We used biomart services using the biomaRT R package  to convert genes names to entrez ids and then the clusterProfiler R package  to retrieve the gene ontology lists. The pathway enrichment is based on the ReactomePA R package . In this section we illustrate the use of Netpredictor package in prediction of drug target interactions and analysis of networks. The information about the interactions between drugs and target proteins was obtained from Yamanishi et al. where the number of drugs 212, 99, 105 and 27, interacting with enzymes, ion channels, GPCRs and nuclear receptors respectively. The numbers of the corresponding target proteins in these classes are 478, 146, 84 and 22 respectively. The numbers of the corresponding interactions are 1515, 776, 314 and 44. We performed both network based inference and Random walk with restart on all of these datasets. To check the performance we randomly removed 20% of the interactions from each of the dataset and computed the performance 50 times and calculated the mean performance of each of these methods. The results are given in Table 3. Clearly, RWR supersedes its performance compared to network based inference in Enzyme and the GPCR dataset. However, computation of NBI algorithm takes less amount of time than RWR. For the drugbank tab we download the latest drugbank set version 4.3 and created a drug target interaction list of 5970 drugs and 3797 proteins We computed similarities of drugs using RDkit  ECFP6 fingerprint and local sequence similarity of proteins using smith waterman algorithm and normalized using the procedure proposed by Bleakley and Yamanishi  and integrated the matrices for network based inference computation. We ran the computations 50 times and kept the significant drug target relations (p ≤ 0.05) where a total of 316645 predicted interactions and 14167 true interactions present in the system. Firstly, the user has to have the R statistical environment installed, for which instructions can be found in R software home page. Secondly, the devtools R package  has to be installed. The package can be installed using devtools R package. Also for fast computation Microsoft R Open package needs to be installed which can be obtained from https://mran.revolutionanalytics.com/documents/rro/installation/. Microsoft R Open includes multi-threaded math libraries to improve the performance of R. R is usually single threaded but if its linked to the multi-threaded BLAS/LAPACK libraries it can perform in multi-threaded manner. This usually helps in matrix multiplications, decompositions and higher level matrix operations to run in parallel and minimize computation times. This will load all the libraries need to run netpredictor in browser. The application can be accessed in any of the default web browsers. The netpredictor R package (https://github.com/abhik1368/netpredictor) and the Shiny Web application(https://github.com/abhik1368/Shiny_NetPredictor) is freely available. Users can follow the “Issues” link on the GitHub site to report bugs or suggest enhancements. In future the intention is to include Open Biomedical Ontologies for proteins to perform enrichment analysis. The package is scalable for further development integrating more algorithms. Authors wish to thank anonymous reviewers for their critiques and constructive comments which significantly improved this manuscript. Authors also wish to acknowledge these individuals for their comments on this project: Dr. Yong Yeol Ahn and Dr. Ying Ding. Authors would also like to thank BMC editors who have waived 50% of the article processing fee. Conceived and designed the experiments and tool: AS. Performed the experiments: AS Analyzed the data: AS. Contributed reagents/materials/analysis tools: AS,DJW. Wrote the paper: AS, DJW. Interpreted the results, drafted the manuscript and contributed to revisions: AS, DJW. Read and approved the final manuscript: AS, DJW. Cao DS, Liang YZ, Yan J, Tan GS, Xu QS, Liu S. PyDPI: Freely Available Python Package for Chemoinformatics, Bioinformatics, and Chemogenomics Studies. J Chem Inf Model. 2013; 53(11):3086–3096. https://doi.org/10.1021/ci400127q. Hinterberg MA, Kao DP, Bristow MR, Hunter LE, Port JD. Görg C.Peax: interactive visual analysis and exploration of complex clinical phenotype and gene expression association. Pac Symp Biocomput. 2015:419–30. https://doi.org/10.1142/9789814644730_0040. Mallona I, Díez-Villanueva A, Peinado MA. Methylation plotter: a web tool for dynamic visualization of DNA methylation data. Source Code Biol Med. 2014; 9:11. https://doi.org/10.1186/1751-0473-9-11. eCollection 2014. R Core Team. R: A Language and Environment for Statistical Computing. 2013. Available from: http://www.r-project.org/. Chang W, Cheng J, Allaire J, Xie Y, McPherson J. shiny: Web Application Framework for R. 2015. R package version 0.11.1. Available from: http://CRAN.R-project.org/package=shiny. Olayan RS, Ashoor H, Bajic VB. DDR: efficient computational method to predict drug–target interactions using graph mining and machine learning approaches. Bioinformatics. 2018; 34(7):1164–73. https://doi.org/10.1093/bioinformatics/btx731. rCharts. [cited 4.1.2016]. Available from: https://ramnathv.github.io/rCharts/. DataTables. [cited 4.1.2016]. Available from: https://www.datatables.net/. visNetwork. [cited 4.1.2016]. Available from: http://dataknowledge.github.io/visNetwork/. Htmlwidgets. [cited 4.1.2016]. Available from: http://www.htmlwidgets.org/. Gray KA, Yates B, Seal RL, Wright MW, Bruford EA. Genenames.org: the HGNC resources in 2015. Nucleic Acids Res. 2015; 43(Database issue):D1079–85. https://doi.org/10.1093/nar/gku1071. Epub 2014 Oct 31. RDKit. Cheminformatics and Machine Learning Software. 2013. http://www.rdkit.org.